No, you can't activate Magician's RapidMode on Samsung M.2 drives - but yes this is a RAM cache. 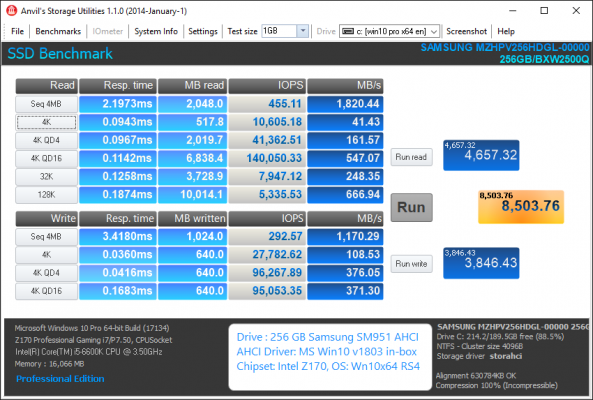 In June 2017 I had already done extended benchmark comparison tests using a lot of different SATA and M.2/PCIe connected SSDs and published the results within the start post of this thread. c) an up-to-date mainboard BIOS, which contains the latest CPU Microcodes to prevent the Spectre/Meltdown vulnerability. I started with a fresh install of Win10 x64 v1803 in AHCI resp. in NVMe mode, updated some drivers (e.g. the Intel Graphics, Ethernet and MEI ones) and installed all currently available Windows Updates. Then I did the related performance optimization steps for AHCI/NVMe systems (look >here<). As last step I cloned the complete backup image of the 220 GB sized OS partitions onto all my test candidates, which were using the same data transfer protocol (AHCI resp. NVMe), after having wiped all previously existing partitions. After having done all these preparations, the tests themselves were very easy. I was able to boot directly into the natively identical OS partition of all the different SSDs and to start my benchmark tests. My question was: Which SSD connection (Intel SATA3 or M.2/PCIe), which Storage Controller interface protocol (AHCI or NVMe) will give my Z170 system the best performance? All test combinations were tested twice and the best result was taken. The performance differences between the SSDs, which were tested in June 2017 and June 2018, and their ranking were quite similar, but all their scores were lower now (obviously caused by the CPU Microcode update). Due to its outstanding WRITE scores the overall performance winner was the brandnew Samsung 970 EVO SSD, followed by the Samsung 960 EVO and Intel 750, which were the best last year. Interesting find like last year: The SSD with extremely good READ scores was again the Samsung 950 Pro. Unfortunately its WRITE scores were as last year very bad in comparison to the winners. I suspect, that my specific Samsung 950 Pro SSD seems to be not the best from that SSD model. The benchmark results of all test candidates were quite different, but I am unsure, if a "standard user" will recognize the differences during his daily work. Remember: These are just synthetic benchmark results, which just show the performance ability of the test candidates. The effective and noticeable performance while working depends on what the user is doing with his PC. Maybe these special SSD performance comparison tests and their results are useful for you. Thanks for your very valuable benchmarks updates. Here are some results I got with a Samsung 970PRO 512GB running under W10 x64 RS4 (1803) last update on a ASUS Sabertooth X99 machine. Test was done with Samsung NVMe driver. Do you have any idea why (970EVO) with MS NVMe driver you get better results than with Samsung NVMe driver ? I have to investigate more if I do observe the same thing with 970PRO. ASUS Sabertooth X99/USB 3.1, W10 x64 RS5 Home FR, BIOS v3902, CPU Intel i7 5930K, Asus GTX 1660TI 6GB DDR6. ASUS PRIME Z390M-Plus , W10 x64 1809, BIOS v2401, CPU Intel i3-8400 (4 cores) GPU UHD 630 , 16GB DDR4 system and i5_9400F (6 cores) with GTX 980 4GB DDR5. Thanks for having published your benchmark results. The Samsung 970 EVO was the only NVMe SSD, which gave me the best results while using the generic MS driver instead of the specific NVMe driver, which has been compiled by the SSD manufacturer itself. Doing a test with MS NVME driver does give less performance than with Samsung NVMe driver for the SSD 970PRO installed on a DT120 add in card (PCIe V3.0 x4) without no heatsink installed on the M.2 device. Tests done multiple times with about one hundred applications installed on and with internet security (anti-virus, malware, web protection, etc..) application up and running. When using the basic DT120 add-in card for mechanical reasons I have not installed a radiator or a heatsink above the M.2 device. A contrario, the KRYO add-in card does offer natively a passive radiator attached onto the M.2 device. Kryo solution is better (but more expensive) for M.2 heat dissipation, and so does offer a max 40°C on the M.2 device. With the D120 I have measured a max 65°C temperature onto M.2 device when running some benchmarks. After having seen >this< post from our Forum member diderius6, I followed his link, downloaded the refered brandnew OFA NVMe driver v1.5.1200.0 dated 07/13/2018 and stated some benchmark comparison tests with my Z170 chipset system running Win10 x64 v1803 on a Samsung 970 EVO SSD. The generic OFA NVMe drivers perform much better than the generic Win10 in-box and Samsung's latest NVMe drivers. Due to its outstanding good WRITE scores the performance winner was the brandnew OFA NVMe driver v1.5.1200.0 (although it has been compiled specificly for being used with Windows Server 2003! The OFA drivers are natively not (v1.5.1200.0) resp. not correctly (v1.5.0.0_157) digitally signed. The installation of the OFA NVMe driver v1.5.1200.0 onto my Win10 v1803 was difficult, because the OS Win10 v1803 didn't even accept the Win-RAID CA signature (estimated reason: the driver has been compiled for being used with Windows Server 2003). I had to force the installation and to disable the "Driver Signature Enforcement". It is very encouraging to see how a correct NVMe driver can improve the performance !!! I assume stability is also improved. It will be great to test soon OFA driver on my X99 with a 970PRO device. What does mean OFA ? OFA is the abbreviation of "OpenFabrics Alliance". >Here< is their homepage and >here< did I find the link to the brandnew OFA NVMe driver v1.5.1200.0 dated 07/13/2018 (you cannot install the linked driver, because the *.cat file is missing). Since several years I exclusively use Anvil's Storage Utilities, when I do benchmark tests. So I cannot answer your question. Here is the ANVIL score I got with a Samsung 970 PRO 512GB device under W10 RS4 after proper Write Strategies Policies settings. test done on a X99 machine. Score is quite impressive and far better than with previous 960 PRO family devices. I do recommend Samsung driver. I know 100PIER has replied, i just want to add something that I found with my ASUS ROG Maximus X Hero mobo that yourself or other readers might find interesting regarding heat-sinks for M.2 drives. The mobo has two M.2 ports, one [M.2-1] has a heat-sink that you remove from the motherboard's M.2 slot, which you screw down onto the SSD drive, so that the heat-sink keeps the chips of the SSD drive running cooler. However, if you want to install 2 M.2 SSD drives the second M.2-2 slot does not come with a pre-installed heat-sink like the M.2-1 port. I believe you can purchase a second heat-sink from ASUS as a spare part? But I find it silly that ASUS did not include 2 heat-sinks one for each M.2 ports, especially when you pay so much for the mobo. i had the opportunity to bench a ASUS ROG Maximus X Hero mobo and do conclude like you the very stupid idea from ASUS to miss to offer a heat-sink for one of M.2 port.